It's true, we live in a time when things that appear on video screens get more attention than things that appear written on a page. But even so, there is still nothing better at the end of a long day, or the beginning of a long weekend, than to curl up with a good book. Grab an old favorite, hit the couch and tune out for a few hours with a snack or your favorite drink. But some of us take it a step further. Our books are more than a hobby or coffee table dressing, they're a passion and like any other collection curated over years and years the books in our homes deserve more than just storage. They should be displayed and celebrated in home libraries that are as beautiful as every other room. So if you're looking to create a shrine to the written word for your own home here are some inspirational masterpieces that will get you going. Like any room in your home, much of the feeling and style of your library will be determined by the furniture you put in. So if you want to add a dash of elegance to your book area, start with something simple like a few classic chairs. The most important part of enjoying your library isn't the books—it's the seating. Comfort is king when you're slipping away into the world of words, so if you've got the space, building a reading nook into your shelving is a natural choice and a great way to save space. Best of all, you'll have no trouble at all breezing through your reading list when all of your books are right there at your fingertips. To give your home office or book area that real library feel will take more than stacks and rows of books. Give your space a little extra personality by always being sure to have some art in the mix. In this space, the artwork is hung directly on the bookshelf making everything part of the same display. Storage is always an important part of keeping every room in your home looking its best. So if your book collection isn't quite enough to take up every inch of shelf space that you have allocated, it's ok to donate space to other items you have that are in need of a permanent home. The key to keeping it all looking good is to keep clear divisions between the types of things that you have on your shelves. A stack of bowls in the middle of your collection of biographies is not going to give you a curated look. So keep things in separate areas and keep each area neat and tidy. Other good ideas include finding ways to link your bookshelves to the rest of the room via color as this room does with its use of red on the shelves and in the seating. Also, note the built-in nook for the love seat. A home office is a perfect spot to pick for a home library. Even if every book on the shelf isn't dedicated to business, it's a wonderful place for a bit of peace while you're reading. Also, when break times eventually do come around, you won't have to go far to find a way to pass the time. Color is as important for designing an alluring library as it would be in any other space. So while browns and blacks are wonderful colors to choose from you're hardly limited to these when planning out your space. This space offers a beautiful look at what can happen with even a simple combination of blue and brown. The mix of ​warm and cool colors in this space strikes a perfect tone of balance. Libraries need to be quiet, not boring. Visually you can have as much fun as you like. This space makes the most of its color palette with a bold, energizing green accented by fun seating in leopard prints. The combination of green and yellow is a classic, and the fun prints help to ensure that there's more to look at in this library than the books. 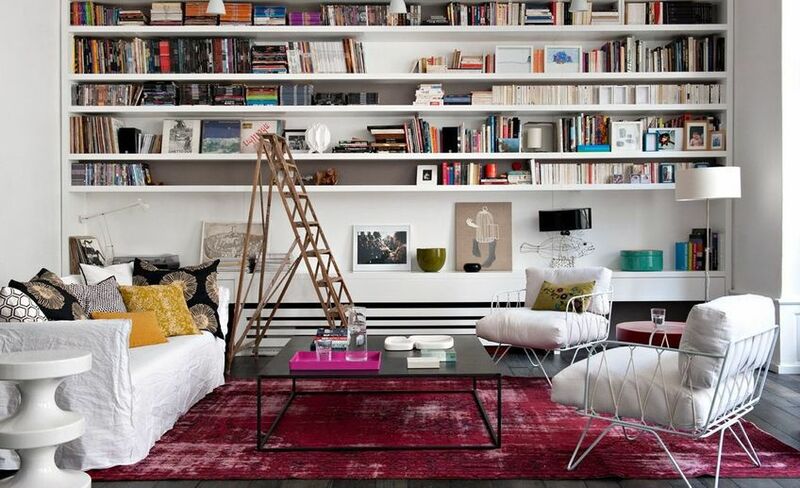 Even the largest book collections can be stylishly displayed with enough space and the right planning. For the book lover extraordinaire, this wrap around bookshelf is a dream come true. When putting together storage for a very large number of books, white is a good choice of color to keep everything looking clean and modern. A library can be an ideal complement to classic architectural moments in your home. A luxury feature of fine homes for centuries, it's a great way to make the most out of some of your home's most interesting areas. This is another intriguing example of how a library can take advantage of the architecture of a classically constructed home. If purchasing bookshelves isn't giving you all of the space you need or if they just don't fit into the space that you have, consider building your own. Though slightly more labor intensive, custom-made shelving offers a number of advantages to the industrious homeowner who is willing to either build them or commission their construction. The most important of these is the flexibility to adjust to small spaces or awkward angles. And if you find yourself in a position where you can't build across, build up. Even though the emphasis in any library will always be on the books, you have more options when it comes to bringing color into the space than stacks of books arranged by color or painting the shelves. All of the pieces that you use to furnish and accessorize your space can add to the color story of the room. In this library, it's the pretty pink chaise lounge and colorful Moroccan boucherouite rug that give this room its colorful character. In this space, it's the vibrant red table that takes center stage, accentuated by yet another colorful rug. Decorate your home library with as much life and vibrancy in the furniture, rugs, and textiles as you would like any other room in your home and you're guaranteed to have a library space you're going to love. If you're big on books, but low on space, one option is to keep the reading area separate by using a curtain. In this home, a simple green curtain is all it takes to create a hideaway library that can appear and disappear whenever it's needed. If your collection of books is sufficiently colorful, you can build your bookshelves from floor to ceiling, using your library as a kind of makeshift wallpaper. Bookshelves don't have to be just for displaying racks of books. Collections of all sorts can find a place in your library. So take a few rows to set aside for showcasing other things that you love. It will make the best use of your storage and give your library some character as well. One of the main reasons why classics remain classics is that they can fit into almost any situation, and when it comes to color palettes, there's nothing more classic than black and white. This full library space maintains a clean and modern look with a color story that is simplicity itself. Of course if classic and conservative isn't your thing, there's always colorful and bold. The pink, gray and blue color palette of this space is just the thing for a lively, energetic library where you can read and read and not fall asleep. This two-story book unit is a marvel of built-in architecture that any book-lover would adore. On the other hand, getting to some of the books on the highest levels might be a little tricky. Turn your book collection on its ear with beautiful shelves built on a diagonal. With just a slight turn, these bookshelves add a bold geometric pattern to the walls that bring instant interest to the room. While to some purists, mixing a television in amongst the books would be the height of sacrilege, for most of us it's just a fact of life. To address these logistics with a bit of style, mount your television inside your entertainment center to give it the look of framed wall art and the feel of being just one more piece in your collection. Even if you're books are not color coordinated it's still possible to create layers of color in your space. In this room, just one purple chair is all it takes to make every other purple moment (and even a few of the pink) burst off of the shelves. Whether it's your book club or a business meeting a long table in a home library or study is unlikely to go unused. In this space, a bright, lacquered red table provides plenty of space for a group study session or an epic all-nighter. Sometimes the best way to bring out what you have on your walls is through what you put on the floor. The bar pattern on this black and white rug echoes the pattern of the books on the shelves. At the same time, the neutral colors of the rug help taper down some of the brighter colors on the shelves. With a bit of art and a few eye-catching accessories thrown in, this is a colorful and stylish place to dive into a good book.